Left Dorgilles Wichmie, Melissa Jeonnat, and right Nathalie Jonnat and Jean Michelda. Reverend Gerard Jean-Juste. Rev. Jean-Juste died two years ago from Leukemia because he was jailed for his political views and was not allowed by the 2004-2006 U.S deposed Gerard Latortue to travel to US to receive early treatment. Jean-Juste's legacy endures amongst the young and old in Haiti. He was [is] like an adoptive father for some people and a mentor to others. Many people sent donations to What If? to support these programs after the January 2010 earthquake. 91 percent of these contributions went directly to Haiti, 5 percent were used for administration and 4 percent for Donor Relations. The organization’s budget for 2011 is $600,000. Although donors are contributing less than they did in 2010, What If? is hoping to raise enough money to not only fund the programs, but to build a school and cafeteria in Petite Place Cazeau, on land they purchased after the earthquake. Every year I make a summer reporting trip back home. Last summer I spent a couple of days following the work of the young people at the What If? office in Haiti. During my summer trip this year, I met with eleven students of the What If? Foundation Education Program. They told their stories in a more wonderful and perfect way than anyone else could have done. Keep in mind that a new page in the history of Haiti is being written after the earthquake of January 12, 2010. Nathalie Jeonnat, 23 who goes to medical school at the prestigious university Quisqueya said,” I always dreamed to study medicine. 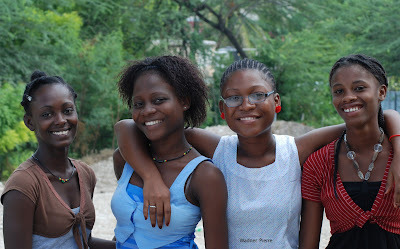 I think it is a good profession, I can help people.” Jeonnat said, “Education is the best way to help Haiti. My parents cannot afford to pay for medical school, and my country did not offer me this opportunity… but thanks to What If I can go. After the earthquake it would be almost impossible… I would say it would be impossible.” She thanks those who contribute to her studies through What If Foundation, “I thank all who help me and What If from the bottom of my heart. I ask them to continue helping, they will not regret.” “They can count on me,” she said. Jeonnat is going into her third year. Kenson Charles is a third year high school student who survived the January 12 earthquake said he would not be in school if the program did not exist. Charles is the older child of his single mother's two sons. He said, “Without this program, I would not able to go school.” Charles thanks those who are helping him through the What If Foundation. He said, “I thank people who are helping us. I would like to tell them to not be discouraged with us.” Charles is suffers from headaches because stones fell on his head during the earthquake. As many young Haitians of his generation, Charles has a dream. He wants to become a civil or computer engineer. Wilnide Etienne is a 9 year-old middle school student. She joined the education program in 2007. She is going into fourth grade this year. Although, Etienne believes she could go to school if the program was not there, she acknowledges that the program means a lot for her. She said, “The program represents a big thing for me.” She remembered Father Jean-Juste while she was talking. She said, “I would like to thank Father Jean-Juste if he was here.” Once can see in Etienne’s eyes that she really misses her pastor. Etienne has one sister. January 12 left behind it a sad story. This story continues to break many hearts like Etienne's. Etienne said, “I lost sisters and brothers during the earth.” With their broken hearts people like Etienne want to go school and want more schools for other Haitians. She said, “For the upcoming year I would like they build where they can welcome more children.” Etienne thanked all who donate to the education program and wished to see the program get more money to buy materials to make to help kids like her. Two weeks ago the Haitian both chambers voted Dr. Garry Conille as the new Prime Minister of the country. On Friday 14, 16 Senators voted Conille political declaration, four voted against it and five abstained. On Saturday 15, 81 Deputies voted for Conille’s political declaration, 7 abstained. Dr. Conille was a former UN employee and senior aid of former U.S. President Bill Clinton at the UN Special Envoy office in Haiti. One of the obligations that Dr. Conille will have is to follow through on the main campaign promise of President Michel J. Martelly - to educate all Haitian children for free. Education is supposed to be a right according to the Haitian Constitution.